Occidental College received a A+. Washington Monthly's ranking of 70 out of 224 of Affordable Elite Colleges - Overall Rank was a major contributor to this grade. Occidental College's undergraduate program requires students to complete a demanding liberal arts core curriculum that includes healthy doses of world culture, math, science, humanities, and a foreign language, in addition to passing a comprehensive examination in a chosen field. Describe the type of student who should not attend Occidental College and explain why. A student who wants to coast through college and have the stereotypical college experience. This is because of how small the school is. Describe the type of student who should attend Occidental College. Why? A student who is passionate about learning and improving themselves. Because of how small the school is, each student gets a lot of individual attention from professors and other peers. What is a typical Occidental College student like? Describe the type of person that should attend Occidental College. 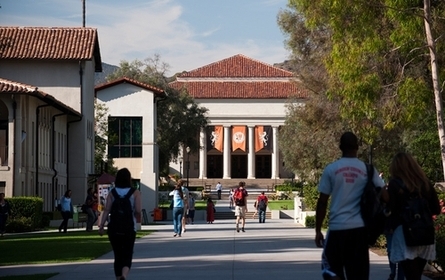 What are the top 3 reasons someone should attend Occidental College? What was a typical Occidental College student like in high school? Describe the type of person that should attend Occidental College. Innovative diplomacy and world affairs program features internships in Washington and at the UN. Extracurricular are a main focus of most students, and there are plenty to choose from. Successful applicants tend to be creative and academically motivated. Student bodies are diverse, but multiculturalism is Occidental College's mantra. Occidental offers you a unique combination of a rigorous academic program, small size, a diverse student body, and all the resources of Los Angeles. Our interdisciplinary, hands-on approach to the liberal arts challenges you to develop a wide range of skills; our close-knit community truly makes us what one college guide calls "an urban oasis." What are the top 3 things that students do for fun at Occidental College? The top three things to do: going to sporting events, participating in club activities, and community service. The average student pays $29,726 for tuition, fees, and other expenses, after grants and scholarships. Total stated tuition is $45,190, in-state and on-campus, before financial aid. Learn more about financial aid at http://www.oxy.edu/admission-aid/financial-aid. Estimate the net price for you at http://www.oxy.edu/admission-aid/financial-aid/net-price-calculator. The typical (median) early career salary of Occidental College graduates is $44,800, according to Payscale. Occidental College participates in the NCAA Division III for college athletics. Want more info about Occidental College? Get free advice from education experts and Noodle community members. If you were student body president of Occidental, what would you change?